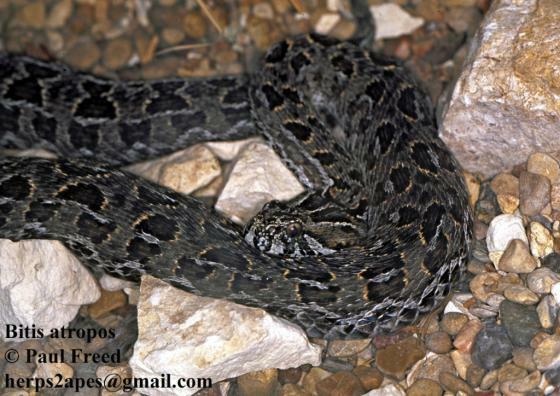 Can you confirm these amateur observations of Bitis atropos? unicolor: Republic of South Africa (E Transvaal); Terra typica: Witpoort, about 20 miles north of Belfast, eastern Transvaal. Diagnosis DIAGNOSIS (unicolor): Head scaling somewhat similar to that in typical atropos, but less strongly keeled and, over back of head, not so markedly elongate; outermost row of scales on body practically smooth anterioriy and but feebly keeled posteriorly; almost uniformly khaki to reddish brown above and apparently a smaller snake than typical atropos. Etymology Named after Atropos, one ofthe three Fates in Greek mythology. She is often portrayed with a pair ofscissors in her hand, as she was the one who cut the thread ofone's life -- thus an apt name for a venomous snake (Beolens et al. 3011: 12). Schätti, B. 1985. Catalogue des types et des exemplaires figurés du Musée d’Histoire Naturelle de Neuchâtel - II. Ophidiens. Bibliotheques et Muses de la Ville de Neuchatel, 1985: 98-108.